PAKWACH – Police and rescue teams in Pakwach district were on Sunday working hard to retrieve victims of an accident in which a Motor vehicle plunged into river Nile. 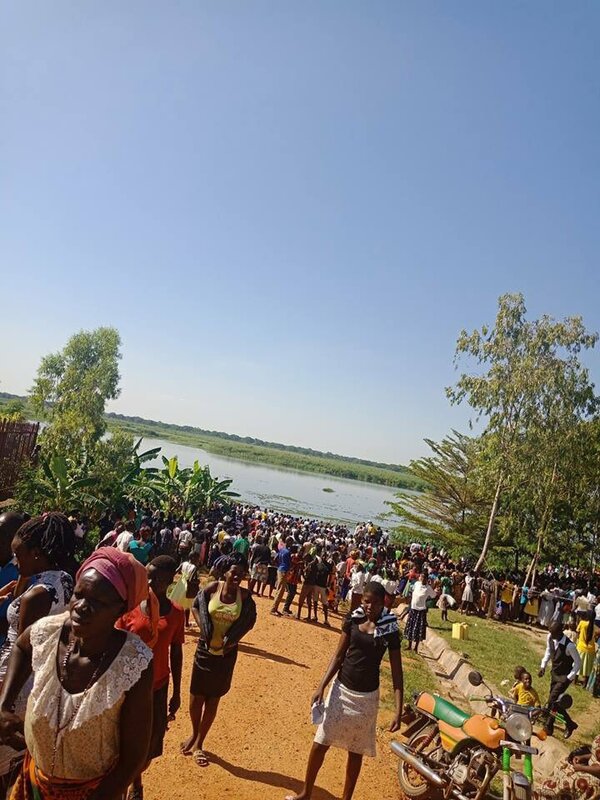 A canter truck registration number UBA 904Z Canter was carrying 20 people from Pabbo county, Amuru district to Panyimur market and plunged into the river at Lubiri landing site in Pakwach Town council. West Nile region police spokesperson SP Josephine Anguncia said the accident happened at around 5 am. She said the track had turned to drop some scraps in a store near the river, however, it failed to brake hence making it speed towards the river and plunged into the water. “The braking system failed and the vehicle continued up to the water. Police together with concerned citizens have already rescued 12 people whom they have been rushed to Pakwach hospital for medical treatment,” he said. She confirmed that three people died on the spot and their bodies have been retrieved while 12 others have been rescued so far. The driver of the truck only identified as Okot Johnson, 27, a resident of Nwoya was amongst the rescued victims but disappeared immediately. The rescued were identified as Onegarach Tom 19, resident of Nebbi, Faube Margaret 46, from Nwoya, Atimango Joyce 30, from Nebbi, Amony Jackline 28, of Nwoya, Okumu Christine 45, of Amur, Aryemo Alice 39 of Nwoya, Ocyel, 40, resident of Amur, Oyela Esther 45, of Nwoya, Loum Daniel 29 years of Pabbo in Amur. The others are Akumu Catherine 50, of Nwoya, Kidega James 28, of Amuru, Okot Johnson 27, of Nwoya district. In July this year, three people died after a truck they were travelling in plunged into the Nile water on Karuma Bridge along Gulu -Kampala highway.